It started out blue at Chanel and just got bluer. Is it the Pan Am influence? 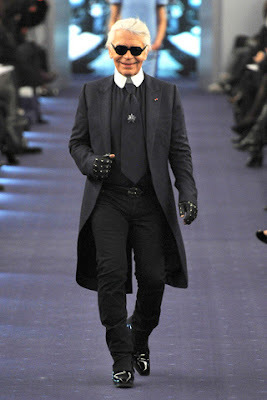 The Chanel haute couture collection for spring/summer 2012 was shown in Paris on Tuesday, with an “airplane” aisle for a runway. Maybe Karl Lagerfeld had the distinctive color of the famous Pan Am uniforms in mind when he decided to make the entire Chanel collection blue. Is he as addicted to the TV show as I am? I wanted to wear most of what I saw on the models and it was inspiring to see all these shades of the same color. If you have 15 minutes, do yourself a favor and check out this show. From ice to baby, from peacock to midnight, Uncle Karl’s got the blues and you’re going to want them too. Who needs the drink cart when the flight attendant is strolling down the aisle wearing this? Make mine a double! I love this coat so much. I want to wear it with jeans and high-heeled black ankle boots. I hope this appears in the Chanel boutique window so I can see it up close. As Rachel Zoe would say, “I love me a (Chanel) sequin.” I’m sure she was dying over this entire collection, as was I.
I adore this iciest of blues. Will we see someone wearing this beauty on Oscar night? Uncle Karl (or is that Captain Karl?) takes his bow. the blues are wonderful, but the stand up, boatish collars are even better. I'm off to watch. Ooh I love the last blue dress, that is stunning. The rest are total Pan Am influence! Just need the hat and bag! Totally love the concept! I honestly still haven't seen Pan-Am yet; I wanted to watch it when it premiered, but I just never got around to it. I love that it's making its way into fashion a la Mad Men. And I love that Karl focused this whole collection on my favorite color! I am sooooo glad to hear from you my dear Jill. I am glad that life keeps you busy. Happy birthday to your darling daughter. Beautiful blues and the collars are so dignified and cool. I would love to have a piece with a collar like this! May your birthday celebrations be fun!! The length of the short sleeves and long sleeves, the wide collars, the texture and patterns - I could wear each and every piece of this collection. Was not always like that!